GameSessions now boasts one million users thanks to its Giveaway promotions. GameSessions is a digital store and discovery service that allows gamers to play a title for a limited time, with the option to purchase a full copy for their Steam library. It's been running since 2016, and the response from gamers has been positive. After playing a trial game, up to 28% of gamers went on to buy a full Steam key. This high conversion rate gave credence to the firm's unique proposition. However, its biggest challenge was growing the GameSessions user base. By the start of 2017 the company had around 15,000 registered users, and the firm was looking to significantly increase footfall to its website. At the same time, many publishers were beginning to recognise the need for greater levels of engagement and awareness through gameplay. This lead to them working with GameSessions on a variety of promotions to support game discovery. In the meantime, GameSessions had been improving and optimising its distribution technologies to deliver games on a global scale. As a test, the company thought it was worth seeing what interest there would be if it gave away a game completely for free. So, in May 2017 it offered Codemasters' Dirt 3. The promotion worked. Traffic and global sign-ups far exceeded the company's expectations, boosted trial engagement and increased sales overall. "GameSessions Giveaways has had a transformative effect on the company, growing its user base from the initial 15,000 to over one million"
Following this success, the company announced in July that it was embarking on a series of the newly dubbed 'GameSessions Giveaways' with titles being released every few weeks. GameSessions Giveaways has had a transformative effect on the company, growing its user base from the initial 15,000 to over one million by the end of 2017. With an increase in user numbers came an increase in download rates as GameSessions saw peaks of 5,400 downloads per hour. Because of this growth, publisher interest has grown and major titles including SpellForce 3, Cities Skylines and Elex have been added to the service. 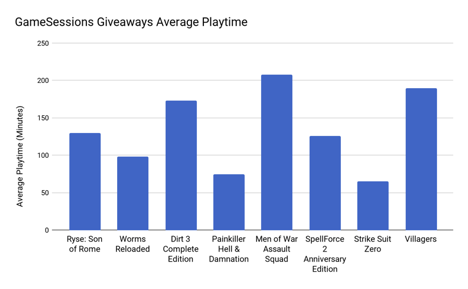 With up to 20 times more trials being played and a significant increase in game sales, the Giveaways model has accelerated GameSessions growth. Now reaching gamers in 179 countries, awareness of and trust in the service has heightened with its own research highlighting that 25% of gamers now know of the platform. This reach has caught the attention of sponsors and advertisers who are eager to use the Giveaways platform to talk to gamers directly. Looking at its data, GameSessions says that users spend an average of two hours playing each game on the GameSessions Giveaways service and when surveyed, users gave the service an average rating of 4.4 / 5. Since the beginning of 2018, GameSessions has added Paradox Interactive games to its trials and giveaways service, offering Cities in Motion to download and play for free from February 22nd. As part of this promotion, the firm has announced the addition of several Paradox titles, which are available to trial and to purchase. "Trials encourage discoverability, help us reach a new and wider audience and give gamers the opportunity to try before they buy," says Paradox's VP of business development Shams Jorjani. "We're very happy to support innovation in digital retail and working with Gamesessions is a great example of this." Paradox is only the first announcement in a busy year ahead with GameSessions in discussions with all other major publishers regarding future projects. This year, the company also plans to improve its platform in a number of ways. The service will be adding a QuickBuy facility to all games so, as well as launching the trial and purchasing within the game, users will be able to purchase a Steam key directly from the website. Additional payment options will be introduced, including Amazon Payments, to give users more choice. "We're thrilled to welcome Paradox to the GameSessions service"
To ensure users have the best possible experience, GameSessions will be releasing a desktop launcher, providing a game library, instant access to download trials and improvements in the system used to transfer saved games to Steam after purchase. Furthermore, because of its increased global reach, GameSessions, which is already available in English, French, German, Italian, Spanish and Portuguese, will offer a Chinese language site later in 2018. "Here at GameSessions, we've been celebrating a remarkable year and it's thanks in no small part to our new Giveaways service," says GameSessions CEO Ed French. "We feel that giveaways are a win-win for everyone as a publisher gets their game played by more people and gamers get to add a great game to their collection, absolutely free. We were blown away by how our giveaways were received. "Thanks to the successes of 2017, publishers are more eager than ever to discuss getting their games onto our platform. We're thrilled to welcome Paradox to the GameSessions service and we're excited to offer some of their latest titles on the trials service including Cities: Skylines with the grand strategy game Stellaris joining the service in late February. Our latest GameSessions Giveaway, Cities in Motion, is also from Paradox. We're eager to build on this kind of engagement from publishers as GameSessions continues to grow. "We know this is a hugely competitive market, but we also know we have a unique technology that enables us to be a different type of service. We can add value through gameplay experiences, we can offer publishers an alternative way to reach customers, and we can build interesting sponsorship opportunities with brand partners that will be in all parties' interests. 2018 will be a pivotal year for GameSessions with much more to come over the horizon."